Background: Age-related decrease in mitochondrial activity has been reported in several tissues. Reactive Oxygen Species (ROS) produced from defected mitochondria lead to aging and accumulate through time. However, studies about the mitochondrial DNA mutation level in blood are contradictory. Other lifestyle factors may modify the effects of age in post-mitotic tissues such as blood. The BMI represents the sum of the various lifestyle factors. 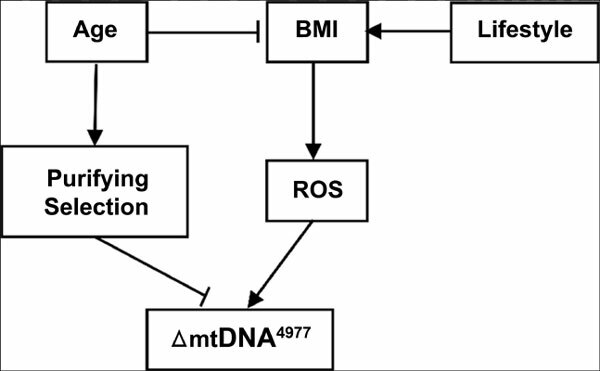 Objective: We proposed that age, obesity and mtDNA deletion are three ROS producing factors, which may interact with each other and induce senescence. Methods: In a cross-sectional study, 172 male and female volunteers without known mitochondrial diseases were selected and the presence of common mitochondrial 4977bp deletion (ΔmtDNA4977) evaluated using Nested-PCR. Results: Our results showed that a high percentage of samples (54.06%) harbor common deletion in blood. Furthermore, both BMI and the ΔmtDNA4977 levels significantly decrease with age. The chronological age, BMI and ΔmtDNA4977 reciprocally affect each other. Conclusion: Our data suggest that age affects purifying selection and BMI, which may influence the relative level of the mtDNA common deletion in blood. Keywords: Aging, mitochondrial common deletion, BMI, ROS, Nested-PCR, mtDNA. Keywords:Aging, mitochondrial common deletion, BMI, ROS, Nested-PCR, mtDNA.